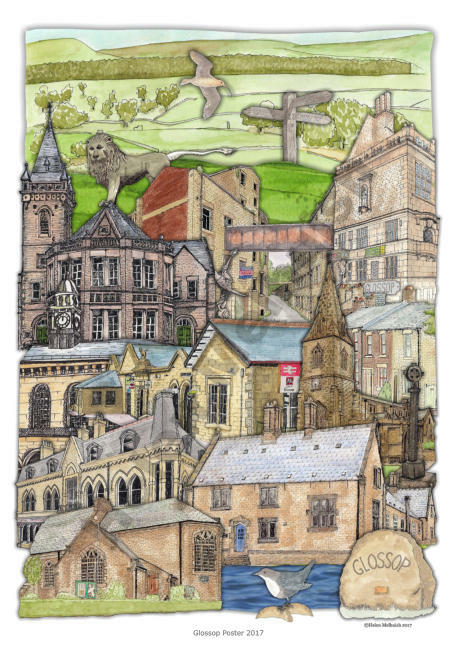 In early 2017 I embarked on a digital project using my original ink and watercolour Glossop art. After very many hours work I created an A2-sized digital collage. 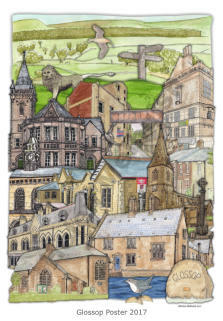 Printed as a poster, it was first exhibited at the Hadfield Open Art Show where it sold on its first morning on display. In August 2017, it was included as part of the Art in the Window exhibition in which local artists showed their work in our shop windows. By the end of September 2017 I had sold 20 Glossop posters, giving half my profit to Breast Cancer Care and Mummy’s Star registered charities. 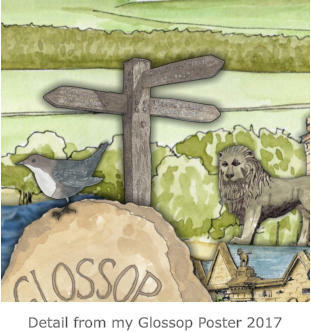 My Glossop Poster is printed to order on 200gsm silk finish paper. Turnaround is usually less than 5 working days. I am happy to either deliver free of charge to Glossop and within a few miles radius, post to you at cost or you may collect. Prices (unframed): A2 £20 A3 £15 A4 £12 Please contact me to order or enquire.